When France initially bestowed the Statue of Liberty on the United States it did so with the understanding that Americans would assume the responsibility for raising the money needed for a pedestal. Unfortunately for the statue's designer, Fr?d?ric Auguste Bartholdi, initial excitement about the statue was fairly lackluster and early fundraising efforts were far from successful. To drum up interest in the statue, which was shipped to America in pieces, Bartholdi first sent over the statue's hand and torch and revealed it at the 1876 Philadelphia Centennial Exposition, where visitors could pay to climb up to the torch through the ladder in the statue's arm. Following the exposition, the hand and torch were displayed in Manhattan's Madison Park from 1876 to 1882, with fundraising efforts including everything from the sale of postcards, to models of the statue, sheet music and benefit concerts and art exhibits. When the completed statue was finally dedicated on Liberty Island in October of 1886 it represented completion of the first successful crowdfunding campaign. 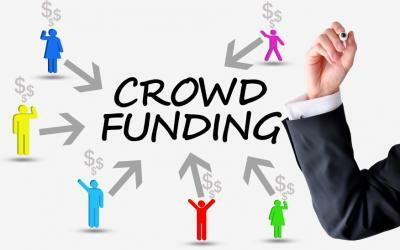 In the 126Ys since Lady Liberty's official dedication, crowdfunding has morphed into an online fundraising vehicle that has been widely adopted by everyone from individuals seeking financial assistance for things such as college fees or medical bills, to major charities and even motion picture producers seeking financing. This made us think about the banking industry's approach to crowdfunding and peer to peer (P2P) lending. Citibank recently made headlines when it partnered with online loan platform Lending Club, a rapidly expanding virtual credit marketplace that promises consumers easy access to lower interest rate loans. Lending Club's services include personal loans, business loans and even loans for elective medical procedures - loans it is actively marketing to physicians whose clientele are likely to fit this bill. By operating purely online and catering to consumers' demand for speed and increased mobile services, Lending Club touts its ability to operate with no branches as a way of passing on savings to consumers. Partnering with a platform like Lending Club, whose stated mission is to transform the banking system into an efficient online marketplace, might seem an odd choice for Citibank. But doing so allows the banking behemoth to fulfill part of its community lending requirements and Citibank is not alone. BI Intelligence reports P2P platforms work because they not only leverage traditional credit scores, but also social media sources to better analyze borrowers. BI also indicates such platforms are popular because they act as "intermediaries between borrower, lender, and partner bank, and thus can keep fees and rates low." No matter the reason, people are using such platforms to borrow, as P2P lenders generated about $6.6B in loans last year in the US alone. For its part, Lending Club hit $1B at the end of 2012 and provided some interesting data about who is borrowing and what they are doing with the money. At that time, it had originated 57,000 loans that were used to pay down credit card debt ($658mm); 14,000 loans for cars and boats ($106mm); 5,600 loans used for home improvement ($62mm); 3,500 loans to finance major purchases ($27mm); 3,200 loans for small businesses ($43mm) and 1,600 loans to fund weddings ($16mm). On a broader scale, the Fed reports P2P lending has grown at an average pace of 84% per quarter since Q2 2007. The Fed also reports that 83% of P2P loans are used to consolidate higher rate credit card debt. While P2P lending is still in the early stages, the online approach of such platforms is being rapidly embraced by consumers. This is particularly true of millennials who do not have strong credit histories, are very comfortable using online channels and do not have the same ties to individual bank brands or specific bank branches of previous generations. We'll keep monitoring things here and reporting back to our community bank readers as we ponder what Lady Liberty thinks of all of this. Treasury yields showed little movement as they hit a five-week low amid global growth concerns and low inflation. Ameris Bancorp ($5.2B, GA) announced it will close 10 of its 103 branches and consolidate them in a move to reduce annual operating expenses by around $5B. Fifth Third Bancorp ($139B, OH) has agreed to sell 12 branches around St. Louis to Great Southern Bancorp ($4.1B, MO) for an undisclosed sum. The branches reportedly hold $261mm in deposits and $155mm in loans. HomeStreet Bank ($4.8B, WA) will acquire Orange County Business Bank ($200mm, CA) for $5.5mm in cash and $49.8mm in stock. Fed SF President Williams said he expects the FOMC will hike rates "sometime later this year." A new report from McKinsey indicates a technology revolution currently underway in and around the banking industry could compromise 67% of earnings on some financial products. Reuters reports discussions with executives who have operations in China indicates the majority think the economy in that country is only really growing between 3% to 5%. Meanwhile, Nikkei reports China's GDP growth is probably 5% for Q2 vs. 7% used in official data. The head of the IMF is warning of troubling signs in global finances, saying she is worried about international economics. In particular, she worried about the sharp drop in commodities prices, the prospect of rising rates in the US and the slowdown in China.